My Fuji slide film (Velvia 50)? I love it, even as its price continues to climb. My eyes are so attended to the hundreds of hours that I spend in the bush. When I get my images back from Parsons, Kansas, the rich color pleases me, for it is 100% true to the real-time butterflies that I see. Yes, tomorrow is my birthday, and it will be a quiet one. On the eve of B-day, I’ve decided to share an image taken in the HolyLand, at Mishmarot, Israel, north of Tel Aviv and 15 minutes from Caeseria, and the Mediterranean Sea. This Plain Tiger butterfly (Danaus chrysippus chrysippus) is closely related to North America’s Monarch butterfly (Danaus plexippus). This Israeli one is much more difficult to approach than our Monarch. Scoring the image was not easy, and closer approach was not to happen. I often wonder how you entertain my frequent sharing of HolyLand butterflies? Me? I think of Who? and How? Th-y saw them back then, and truth be told, I am moved by that. But with my Birthday hours away, I am going to hope that . . .
Late to the party? Caron, on being asked to share her 5 favorite images, did, quickly. She just as quickly asked me to share my 5 favorite images. Beware what you ask for! Now that I’ve shared Jeff’s Earrings and that Northern Pearly-Eye butterfly, I’m ready Caron, with this, my 3rd inclusion in the Caron series of favorites. I’ve begun to see that my favs are heavily influenced by beauty, and by the fortuitous circumstance at the time. This shot was not taken in Wisconsin, or Pennsylvania or Georgia or Nevada. It was taken about 1 hour north of Tel Aviv, in the meadow that separates Mishmarot from its orange, mango, grapefruit and lemon groves. Israel. My daughter and her 2 little boys live there. She ended up preferring village life over her Ernest & Young job (Tel Aviv) or her Washington, DC job (SEC CPA). I was visiting, and that morning got up very early, to make sure that I got out to those meadows early, very early. I love getting to habitat early, to maybe, possibly find butterflies that have just left their night perches, and are on low hanging leaves, warming up in the morning sun. There, many skittish butterflies will tolerate a close approach, as they enjoy the warmth of the Wisconsin or Middle East sun’s ray. I saw this Melitaea Phoebe telona enjoying his sun bath, and well, he was handsome, very. I made a very low, slow robotic approach. He did not move. You know the rest, I shot, shot, shot, shot . . . I don’t manipulate my images, and I have liked this from the first. Fritillary butterflies? They can be visual elixirs, so visually stimulating that they make an entire morning, if you know what I mean. This one, Melitaea phoebe was met in the agricultural fields surrounding Mishmarot, north of Tel Aviv, and close to the Mediterranean Sea. I’ve been fortunate to have seen so many fritillaries now: Great Spangled, Aphrodite, Meadow, Mexican, Gulf, Variegated and Melitaea Persia montium on the peak of Mt. Hermon (Israel). 2018? July beckons as the month I will find Diana. Where? In the mountains of north Georgia. Exactly where? I don’t know, but I will search and search those north Georgian state parks, especially those in northwestern Georgia. Diana fritillaries, I am told, are huge and spectacular. Alone again, naturally. 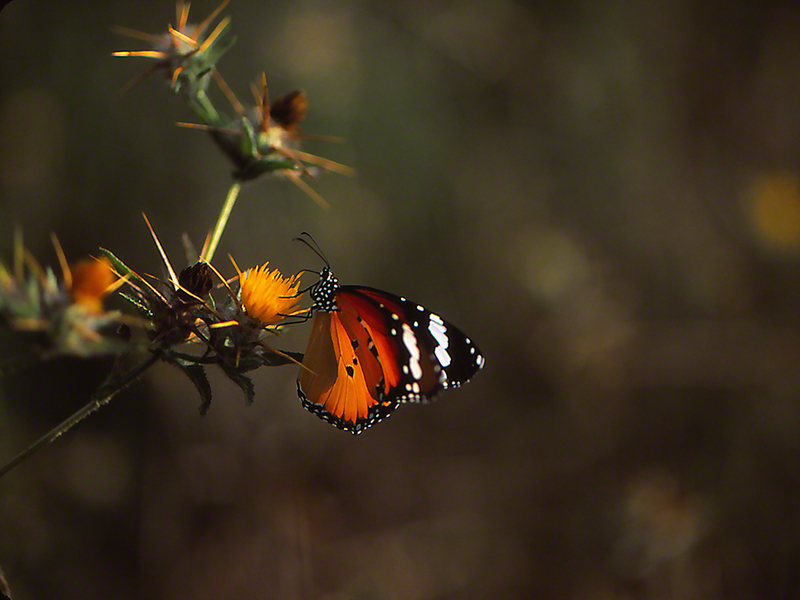 We met along those rough agricultural roads in Mishmarot, Israel. Amidst agricultural orchards planted with orange, grapefruit and tangerine trees, lined up as far as your eye can see. A dainty Israeli blue butterfly is common enough in the HolyLand. The seeker of butterflies toiled in his brain, Don’t I already have good images of this Lampides? Blush, for even though that is true, this sweetie sipped nectar so slowly, so regally, that up came the 100mm/2.8 Macro- lens, and I shot away. When an eye pleaser like this one, a fine example of its species, and fresh out of its ‘make-up’ before camera shoot session presents itself, there remains no other choice than to Shoot! Shoot! Shoot! Would You Contemplate a Thistle? Absent a steady menu of butterflies, my mind and my eyes scan for beauty, the new, the yet unknown, and I forever look for the inexplicable. It’s the inexplicable here in the native growth along the berm of an unimproved agricultural dirt road in Mishmarot, Israel. My Handbook of Wildflowers of Israel – Mediterranean Flora by Darom and Shmida, is written in Hebrew, so I am at some disadvantage. Nonetheless, this would be Notobasis syriaca, and the timing is right, with this viewed in April 2017. The oft asked question, for me, is, is this film worthy? Your response, remains a question for me. Me? The color, severe angles and impressive armament of this plant evokes much for me, mostly of a life in Brooklyn, and on the subways, when I too carried long cold steel, in my pocket. Standing there, shooting away, trying for a good look ar Notobasis, I rattled off in my mind the HolyLand Patriarchs and Matriarchs who must surely have also stopped at these wonders of Creation, and admired, just as I did.